If you’ve ever met me in person you might have noticed that I have O-Z-Z-Y tattooed on my left knuckles, my first tattoo back when I was 18. When Sabbath reunited with Ozzy Osbourne in the late 90s the first show of the US tour was at Nissan Pavilion (now known as Jiffy Lube Live). They had a tent there and people were waiting hours to get tattoos but when they heard I wanted Ozzy on my hand they rushed me right in. The people working the tent were taking pictures and shooting videos of me getting my tattoo, it was a fun experience. I figured if there was ever a day to get Ozzy tattooed on my hand that was it. I used to draw it on there with a ball point pen every day anyways so this saved me money on ink costs. Since it’s a visible tattoo people often ask if I ever regret it and I never have, though it’s funny when people ask if (or just assume that) my name is Ozzy, haha. Anyways, a lot of people have asked for my opinion on the new Black Sabbath album, 13, since I’m such a big Sabbath fan. Is it as good as the classic albums from the 70s? No. I don’t think it realistically could be. But that doesn’t mean it isn’t a really good album. I think the track order (here) is poor and the better songs tend to be later in the album. I like the first two songs, both of which are over 8 minutes long, but I don’t think they were the best songs to get people into the album. Casual fans of the band, or people just interested in all the hype, may lose interest and not make it past that point. Also, the choice of the slow to build up second track, “God Is Dead?,” as the lead promotional song seems kind of dumb. I think the shorter song “Loner,” which has a catchy riff right from the start, would have been a better choice for drumming up early interest. The song “Zeitgeist” is my least favorite of the album. It’s basically a rehash of “Planet Caravan,” from their 1970 album Paranoid, but far less interesting and just not as good. That said, I think the band really starts to sound good on later tracks like “Age Of Reason” and my (current) favorite song from the album, “Damaged Soul.” The sad riff on “Damaged Soul” along with the use of a harmonica shows Black Sabbath still have their roots in the blues. “Live Forever” is another really solid song that I think should have been the album’s opening track. The closing song of the album, “Dear Father,” discusses the issues with priests hiding crimes by the clergy, though it isn’t as somber as you’d expect due to one of Tony Iommi’s signature heavy riffs. Ozzy’s voice is heavily processed throughout 13 but that’s pretty typical these days for any older studio vocalist (hell even the younger ones can’t quit their Auto-Tune addictions). Even in the studio he doesn’t have the energy that he used to in his youth but this isn’t a band of 20 somethings anymore, they’re musicians that have been making music for over 40 years now. The Black Sabbath sound has matured and aged with the members and that’s not a bad thing. Tony Iommi’s riffs are as thick and heavy as ever, further proof to everyone that he’s still the Riff Master. 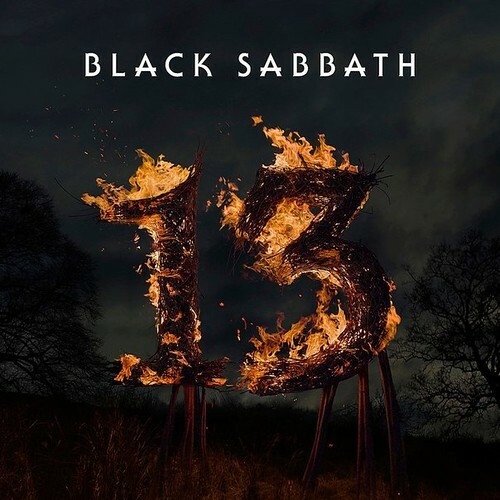 Geezer Butler’s bass playing is excellent throughout 13 reminding us all that there is a place for bass guitar when mixing metal albums. As for the drums, well, Rage Against The Machine/Audioslave drummer Brad Wilk is probably the weakest link of the band. He isn’t really an official member but just did session work after contract disputes (thanks Sharon) left original Black Sabbath drummer Bill Ward out of the production of the new album. To put it bluntly, Brad Wilk’s drumming on 13 is just boring. It is so uninspired that they may as well have gotten a drum machine instead. This might not even be his fault though. With the Sabbath guys and producer Rick Ruben all running things in the studio, he was probably just told to keep things simple to have the focus on the three other musicians. This might work for newer fans of the band but to those more familiar with Ward’s work in Sabbath it just makes his absence even more apparent. I really hope that Tommy Clufetos does a better job playing live with Sabbath on tour this year than Wilk did in the studio. The album closes with the fading sounds of rain, thunder and a church bell that is almost exactly like the intro to the song “Black Sabbath,” the first song on the band’s self titled debut album. But wait, there’s more! Four original bonus tracks not on the regular album can be found in various places. My favorites are the riff filled song “Pariah” and the faster paced “Naïveté In Black”. There’s also a live version of “Dirty Women” that was recorded at a show in Australia in April 2013, suggesting they might be playing the old song on their upcoming tour. Which, by the way, comes to town on Friday, August 2nd at Jiffy Lube Live (details here). In all this isn’t my favorite Black Sabbath album but it is the one we got in 2013 and I’ll be damned if I don’t play the hell out of it. New Sabbath fans might want to start with one of the first five albums, or maybe even the best hits collection We Sold Our Soul For Rock ‘N’ Roll, but long time fans shouldn’t have any gripes about adding this to their Sabbath collection. The most anticipated metal album of the year is here and it is definitely worth the listen. Feel free to leave a comment telling me what you think of the new album. Did it exceed your expectations or do you think it was just a cash grab? Is it better than the 2009 Heaven And Hell album, The Devil You Know, with Tony, Geezer and vocals by the late Ronnie James Dio? If you think you could have written a better review check out this post and see if you’ve got what it takes to review albums here on DCHeavyMetal.com And of course, be sure to check out a few new songs from the album below that I picked to give you an even better idea of what’s on 13. I think The Devil You Know was much better, of course due to Dio’s influence. Aside from being a stronger singer than Ozzy, he was a better songwriter as well. I agree with the weakness of the drums on 13, if only Vinny Apice could have been brought in as a Ward replacement instead…. I think 13 is a better listen than The Devil you Know, and also Never Say Die or Technical Ecstasy. It certainly exceeded my expectations. great review! I tend to agree, that the better songs are on the second half of the album. my favourite tracks are Age of Reason and Live Forever. to echo the comments of the reader who was asking for more non-DC related album reviews, I’d be interested to read your thoughts on the new Megadeth album.